Kathy Liebert was born in Nashville, Tennessee on October 1, 1967. Before turning into a poker player, Kathy Liebert was a business executive. However, she didn’t enjoy the job, and thanks to some successful investments on the stock market she was able to quit her job and move to Colorado. She started playing at the nearby casinos and became a prop player. Kathy Liebert decided to play in some Las Vegas poker tournaments, and in one week she made $34,000. 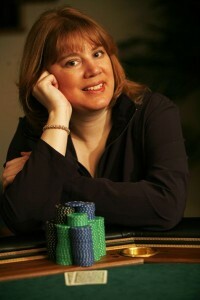 Soon after, Kathy Liebert moved to Las Vegas and began her poker career in earnest. Kathy Liebert is the first woman to win a poker tournament with a buy-in of $5000 or more and is also the first woman to win a prize of $1,000,000 in a poker tournament. In 2002, she won the PartyPoker.com Million event to win the first prize of $1,000,000. Kathy Liebert has won one World Series of Poker Bracelet, playing in a $1500 Holdem Shootout event. She has also made several final tables at the World Poker Tour. Kathy Liebert also won GSN’s Poker Royale: Battle of the Sexes, beating out 11 other men and women for the championship. Kathy Liebert provides tournament commentary from time to time. She has nearly $6 million in tournament winnings and has had 13 first place finishes. Her favorite poker game is the No Limit Hold’em. Kathy Liebert still dabbles in the stock market, and she also has a blue belt in karate. She currently has homes in Las Vegas, Nevada and Downey, California.